If you're like me, when hot weather hits it's time for new running shoes. In the fall and winter I tend to stick to more of the standard running shoe; with a leather and mesh upper, something with stability, and a shoe that is just more equipped for colder weather. But once summer is here, it will be time to pick something fun, lightweight but still supportive...after all my knees aren't what they used to be. 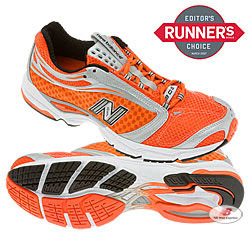 The New Balance 902 was named Editor's Choice by "Runner's World" magazine. While the 902 is lightweight and supportive, it is not for every runner. Runner's World magazine explains; "We recommend the shoe for lightweight runners with normal arches looking for a training or racing shoe." So if it's time for a new pair of summer running shoes, and it seems like the 902 could be what you are looking for, check them out while supplies last! If you are a runner who has tried the 902, post your review on our blog and let us know how it performs. This shoe may only be 10 ounces but it feels much more substantial than that! It uses an acteva ultra lightweight midsole which is lighter than their traditional acteva/acteva lite midsoles, yet it lasts even longer. It's got a great ride for any kind of workout, whether it be long runs or speed work. Very similar feel to the 825 but a touch more support, but hardly noticeable. From my experience, they don't break down nearly as fast as the 825's.